In researching chemtrail sightings and theories, I was stunned to learn that this phenomenon didn’t begin with people noticing persistent contrails in the sky, wondering what they could be, and searching for explanations. Chemtrail theories actually began as a horror story about deliberate world depopulation, crafted and spread by a small network of Christian Patriot conspiracy researchers – including one rather infamous anti-Semite. There are strong indications that at least some of these guys were trying to create a contrail cash cow for themselves, which has forced me to rethink the entire chemtrail phenomenon. It was my original view that the chemtrail issue is not, as the U.S. Air Force contends, a hoax. I believed that like most conspiracy theories, chemtrail theories evolved in organic fashion from various anecdotes and incidents. That’s not to say there haven’t been hoaxes. Photos have been altered, then distributed among chemtrail researchers. Less than credible “whistleblowers” have told bizarre stories that can’t be verified. Clearly, anyone who engages in this sort of fraud isn’t searching for the truth. In my experience, the average chemtrail-watcher is searching for the truth. He is concerned about the potential effects of chemtrails, and he wants answers. Now, after looking into the history of the phenomenon, I suspect the hoax allegation has some merit, after all. I still believe the average chemtrail-watcher is a genuinely concerned citizen who honestly believes he is seeing strange, unexplained vapour trails, and doing what he thinks is right. But I do not trust the motives of those who started the rumours of death-by-contrail. To see why I reached this conclusion, let’s examine the history of chemtrails. Farmers, environmentalists, and others in the eastern U.S. report that ground water is contaminated with ethylene dibromide (EDB), a carcinogenic chemical used as a pesticide and as an anti-knocking agent in leaded aviation fuel (“avgas”). EDB has been never a component of jet fuel, because jet fuel does not contain lead. EDB is banned for pesticide use in some places, phased out in others (in remains in use to this day in some areas). EDB use in avgas is phased out. HAARP installation begins in Gakona, Alaska. Concerns about EDB contamination resume among some Christian Patriots. They suspect that the newly-introduced military jet fuel JP-8 contains some contaminant, or combination of contaminants, that are intended to kill us. The prime suspect is – guess what? – EDB. These concerns rapidly spread throughout the country via online message boards and mass emails. The Contrail Science website contains links to what appear to be some of the earliest known online references to unusual contrails, which would later be called chemtrails. This material was originally published on The Patriot Page (the now-defunct website of Clarence Napier, still accessible via the Wayback Machine). In emails distributed through BIOWAR-L (an email list service dealing with biological weapons), people exchanged information about “mysterious” persistent vapour trails left by military jets throughout the U.S., the health effects of EDB, and the depopulation conspiracy theory. A few people submitted soil and water samples for lab testing, which confirmed the presence of EDB (not surprising, as it is known to persist in ground water). They concluded that EDB was coming from the sky. These test results, if they ever existed, were never actually reproduced. Acting on information he allegedly received in 1993, Larry Wayne Harris of Lancaster, Ohio begins selling a self-published booklet (Bacteriological Warfare: A Major Threat to North America), warning that Iraqi sleeper cells will launch anthrax attacks against multiple cities in the U.S., aiming to reduce the U.S. population to 50 million by 2025. He conducted research for this booklet at the library of the Aryan Nations compound. 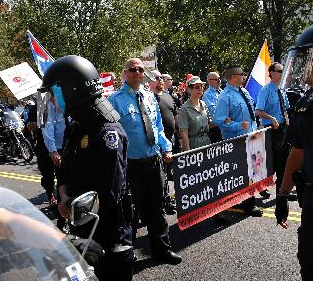 He was a card-carrying member of Aryan Nations, which is not only America’s largest white supremacist organization, but also the nation’s largest and most violent prison gang. I’m sure we can trust their impeccable research skills. At the time, Harris believed Jews controlled the world and had to be opposed (according to the Anti-defamation League, he later renounced these views). Harris claims the information about impending anthrax attacks was given to him by the daughter of a former Iraqi president. She allegedly told him that Iraqi women were smuggling massive amounts of weaponized anthrax into the U.S. in their vaginas, preparing for synchronized biological assaults on numerous U.S. cities that would reduce the nation’s population to just 50 million souls by the year 2025. In the spirit of goofy FBI code-names, let’s call this plan VAGTHRAX. Harris makes some cash selling his booklet about VAGTHRAX at gun shows and conspiracy conventions, scaring the hell out of his fellow Patriots and Aryan brethren. Though Harris was supposedly teaching people how to defend themselves against terrorist attacks, it has been noted that his booklet appeared to double as an instruction manual for terrorism. For instance, it laid out in considerable detail how to sabotage power lines and launch large-scale biological attacks. Not exactly information the average American would need. Harris is arrested and charged with mail fraud after posing as a research microbiologist to obtain bubonic plague from the American Type Culture Collection. He had stolen some stationery bearing the letterhead of the Ohio lab where he was employed as a water inspector to do this. Convicted of mail fraud, Harris is placed on probation. Harris claims to be a CIA asset and a licensed microbiologist throughout most of the ’80s and early ’90s. He also boasts that he has scientifically proven the existence of God. None of these claims are true. He continues to warn about impending Iraqi bioattacks for the next three years. Most of the early Internet communications about poisonous contrails mention Harris as a good source of information on the topic. Christian Patriots are advised to submit soil and fuel samples to him for testing. At least one EDB/JP-8 researcher, radio evangelist Bill Brumbaugh, submitted a JP-8 sample to Harris for analysis in the late ’90s. Harris, without supplying any documentation, reported that the jet fuel contained EDB. Questionable results like these were trumpeted throughout the Patriot/conspiracy community, adding literal fuel to the fire. The Defense Department publishes a study, Weather as a Force Multiplier: Owning the Weather in 2025. This paper will become central to the weather control/geonengineering theories about persistent spreading contrails, which gradually overshadow the EDB/depopulation theory. Richard Finke and Larry Harris set up a “defensive biowar and disaster recovery” consulting firm called LWH Consulting. They promote their services by sending out mass emails warning that a biological attack on the U.S. is imminent, and posting information about poisonous contrails on message boards. LWH Consulting was legally incorporated under the name of Harris’ attorney, Curt Griffith, who was suspended from practicing law in the state of Ohio in 2004 for ripping off two of his clients. Griffith also defended Harris in court. In 2000 and 2001, Larry Harris hawked a line of Solutions-4-You® anti-microbial products and a lichen-based herb called Lechenya Meera that could supposedly protect you from anthrax and other biochem warfare agents. He claimed a Ph.D at that time, though I can’t find any confirmation that he has one, and billed himself as “one of 17 registered microbiologists in the US” (I rather doubt this, as the National Registry of Certified Microbiologists certifies dozens of registrants each year). Because chemtrail information is so closely tied to product placement and dishonest self-promotion like this, we should not eliminate the possibility that chemtrail theories are driven – at least in part – by profit motives. Harris and a cohort, William Leavitt, are arrested in Vegas for possessing anthrax. When the anthrax turns out to be an avirulent strain, Harris is charged only with probation violation and receives a longer, more restrictive probation for impersonating a CIA agent. 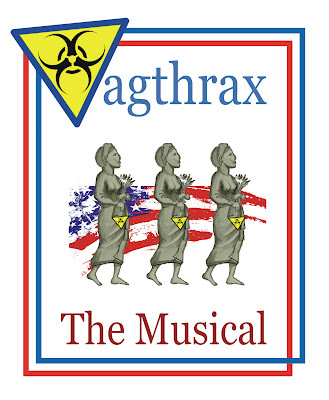 Though Harris wasn’t in possession of any dangerous biological agents this time, the Vegas anthrax arrest scared the hell out of people and made national headlines. It was alleged that Harris wasn’t just warning the world about impending biological attack – he was planning one himself. A cohort had reported to authorities that Harris boasted about possessing enough anthrax to poison a U.S. city. After Harris’ second arrest, the speculation about persistent contrails gradually shifted from EDB to other toxic ingredients (mostly metals). But the legend of EDB-contaminated jet fuel lives on. Joseph E. Mario, in his Anti-Aging Manual (1998), declared that EDB was being dispersed over the U.S. via JP-8 jet fuel exhaust (contrails) for the purpose of indiscriminate population reduction. As “evidence”, Mario noted that EDB had been detected in Cape Cod cranberry ponds, Maryland and Pennsylvania. Again, this can be explained by agricultural fumigation. There was no need to bring aircraft into the equation at all. Tommy Farmer collects samples of what he calls “angel hair”, a fibrous material presumably deposited by aircraft on six occasions between February, 1998 and January, 1999. The term might be familiar to UFO buffs, as “angel hair” was a common feature of early close encounter reports. Farmer claims he fell ill after his first contact with the “angel hair” (today, sticky filaments known as “chemwebs” are still being reported). months, kept alive by only a handful of conspiracy researchers like Clarence Napier, John Hammell, Chip Tatum, Dot Bibbee, and Joe Burton. 1999, on the other hand, would be the Year of the Contrail. The “poisonous” contrails are sprayed by “fleets” of aircraft flying in gridlike patterns. The “spraying” is done by military jets. Thomas described the work of Tommy Farmer, a former engineering technician with Raytheon Missile Systems who had been tracking the patterns of jet contrails for more than a year. Farmer “positively identified” two of the aircraft most often involved in aerial spraying as the Boeing KC-135 and the Boeing KC-10, both used by the U.S. Air Force for air-to-air refueling. The “spraying” is also done by unmarked military jets. Contrails may be part of HAARP-related experiments. Contrails may contain substances that facilitate weather modification, and substances that are harmful to us, such as bacteria. Contrails may cause a variety of ailments, ranging from respiratory difficulty to lupus. No direct evidence of a link between contrails and these ailments is provided by Thomas; he is content to rely upon anecdotal evidence. Anecdotal evidence is a great place to start. It is not a great place to finish. Thomas also rehashes the EDB-in-jet-fuel theory, and mentions public concerns about fuel dumping (discussed in Part III.5 of this series). Art Bell discusses contrails on the popular paranormal-themed radio show Coast to Coast AM for the first time, with guest Will Thomas. The most astonishing thing about this email is that the epidemic Thomas describes didn’t exist. There were no reports of a “mystery” respiratory illness published by the New York Times or the BBC in 1998 or 1999. Rather, there was one article in the Times about a well-known virus that affects infants and young children (respiratory syncytial virus, or RSV). If 6000 people in England alone had perished from the same illness in two weeks, this would have been an epidemic on par with the influenza outbreak of 1918. Yet I could not find a single 1998 or 1999 article (BBC or otherwise) that included information about 6000 sudden deaths in the UK. There were plenty of media releases concerning outbreaks of respiratory illnesses that occurred that year (see this one on an illness in Afghanistan or this one about Nipah virus in Singapore and Malaysia, for instance). In these cases, dozens or even a few hundred people fell ill. But 6000, in a single country? No, nothing on that scale happened in 1998-1999. If Thomas did, indeed, see a “BBC photo” of a truckload of corpses, it was either unpublished or misrepresented to him. As for the “many” coughing-related deaths in Louisiana, Thomas provides no verifying information. My own search for a ’99 Louisiana outbreak of respiratory illness came up empty. In short, this terrifying email does not contain any verified information. In the winter of 1998-1999, neither the flu nor respiratory illnesses other than RSV were particularly serious. In 2000, the CDC reported the “numbers and types of circulating influenza viruses are similar to the previous two seasons (1997-98 and 1998-99). These findings suggest that this year’s flu season has not been unusually severe.” Even if the flu or respiratory illnesses had been worse than usual in 1998-1999, the connection to contrails would not be a given. Such outbreaks are not uncommon. In another post, we’ll look more closely at Will Thomas’s chemtrail research and some of the other bizarre misinformation he has been disseminating. It will be obvious that his scientific knowledge is extremely limited. This is not an insult; it is a statement of fact. Ignorance is nothing to be ashamed of, because it does not have to be a permanent condition. Mr. Thomas can brush up on his science skills anytime he chooses. Clarence Napier, a Christian Patriot conspiracist, claims to have located the “hidden” HQ for the death-spraying “United Nations” planes in Arizona. He declares that Arizona is the epicentre of contrail-poisoning activity (to this day, Pheonix remains a central hub of chemtrail-watching and activism). In the last post, we explored how firefighting planes (particularly Everygreen Aviation’s Supertanker) have been repeatedly mistaken for “chemtrail-spraying” planes. Napier postulated that these unmarked planes were United Nations aircraft, and that the purpose of the spraying was to sicken and kill people all over the world. He posted photos of the “hidden” airfield on his website without identifying it. One diligent researcher investigated and learned the airfield was Chandler Memorial Airport, an airfield owned by the area’s Pima and Maricopa Indian Nations. Since 1978, the airfield has been leased to International Air Response, an aviation outfit that had been contracting with the U.S. Forest Service to fight forest fires since the late ’60s. The entrance to the Chandler Memorial airfield was not hidden, and its operations were not secret. The word “chemtrail” begins appearing online. A portmanteau of the words “chemical(s)” and “contrail”, its exact provenance is unknown (I have been told by many chemtrail-watchers that Will Thomas coined the word. This may be true, but all I know for certain is that the word didn’t emerge until the spring of 1999. I have found no appearances of the word prior to March of that year). Jay Reynolds, who has been researching the contrail-related conspiracies since the late ’90s, has stated the word was coined by former USAF captain John Grace, who used the pseudonym “Val Valerian”. In the early days, when the contrail theories revolved around a chemical pesticide, “chemical contrail” made sense. But today, when the theories are focused on metal oxides, “nanobots”, and fibers, “chemtrail” is a bit of a misnomer. Art Bell again discusses chemtrails on Coast to Coast AM, with guest Clifford Carnicom. The white supremacist/conspiracy publication The Spotlight begins publishing stories about contrails, promoting the theory that they are part of a secret military operation. Clifford Carnicom sets up his first website about chemtrails. When it comes to chemtrails, I don’t think it would even be possible to overestimate the work Clifford Carnicom. He is, quite simply, the leader in the field of chemtrail research. Will Thomas and others are certainly influential, but it is Carnicom who has introduced each new “discovery” about chemtrails. Carnicom was the first person to produce a documentary about chemtrails (Aerosol Crimes, 2004). His was the first major website devoted to chemtrails. He was the first person to publish articles on the alleged links between chemtrails and Morgellons disease. He was the first to document what he believes are “nanotech devices” in Morgellons sufferers. It’s safe to say that whatever theory Carnicom comes up with next, the majority of chemtrail-watchers will accept as probable. Chemtrails are mentioned under the heading of “exotic weapons systems” in a bill sponsored by Dennis Kucinich, H.R. 2977 (107th): Space Preservation Act of 2001. They are removed from subsequent versions of the bill. On Coast to Coast AM, guest Will Thomas discusses the theory that the military is using jets to spray aluminum oxide and/or barium stearate into the air for weather modification and advanced radar/HAARP experiments. The biowarfare theory of chemtrails, introduced to the public by Will Thomas in ’99, becomes much more popular in 2003. It is reinforced by the claims of Clifford Carnicom, who says he heard important information from another researcher, who heard it from a military source. According to Carnicom’s source, airplanes are dispersing polymer filaments with freeze-dried bacteria or viruses and metals (barium, aluminum) attached. The metals heat up from the sun, allowing the pathogens to survive in the cool air. The ultimate goal of the spraying, Carnicom states, is the “control of all populations through directed and accurate spraying of drugs, diseases”. He declares that people who have “tried to reveal the truth have been imprisoned and killed”, but does not provide any names for verification. The incredibly weird “sylph” sightings begin. Chemtrail watchers report seeing cloudlike forms absorbing chemtrails, then vanishing. Some believe the sylphs are living creatures. Others suspect they are supernatural entities along the lines of angels, or nanobot swarms that can be manipulated remotely (like the Smoke Monster in Lost). Clifford Carnicom releases his self-produced documentary Aerosol Crimes, the first feature-length film about chemtrails. As with any conspiracy theory that gains some traction, infighting and suspicion among researchers soon surfaces. Chemtrail-fighter Don Croft declares that Carnicom’s Aerosol Crimes is disinformation. Croft tries to eliminate chemtrails with Reichian orgone devices (bits of metal). Lydia Mancini starts the website Barium Blues to document the “barium chemtrails” she has been seeing since about 2003. Will Thomas publishes his book Chemtrails Confirmed. The Discovery Channel program Best Evidence airs a show on chemtrails. Toxic Skies, a fictional movie dealing with chemtrails, is released in Australia. The second film from Canadian thriller/horror director Andrew C. Erin is a medical thriller, starring Anne Heche as a virologist struggling to identify a mysterious disease. As a medical thriller, the film is deeply uminpressive (at one point Heche’s character declares, “We don’t know if it’s Avian Flu or bubonic plague”). The film receives attention in the conspiracy community for three reasons: It explicity mentions chemtrails, the context is profoundly negative, and it was “banned” in North America. Spoilers: The virus is being spread via pellets that have been mixed into jet fuel (must be one tough virus to survive not only the temperatures of a jet’s fuel system, but the cold temperatures of high altitude). The virologist develops a vaccine to inoculate people against the virus, and must race against the clock – and the bad guys- to deliver it. The film was shot in Spokane by a mostly Canadian crew, but premiered in Australia, causing some chemtrail researchers to cry out that it had been “banned” in the U.S. In reality, the film was simply picked up by a foreign distributor. The highest bidder gets distribution rights, and the American distributors evidently weren’t impressed. After being screened in Australia, Toxic Skies began showing up everywhere else. It is available in the U.S. and Canada. It’s even on Netflix. Then there were those who believed Americans were supposed to see the movie. You see, many conspiracy researchers believe in something they call “predictive programming”. In essence, they contend that the world’s elite (the Illuminati, the globalists, the lizards, etc.) are required by some ancient code of conduct to have willing victims (I mentioned this briefly in a Wednesday Weirdness Roundup, in relation to Beavis and Butthead “predicting” 9/11). In other words, They have to tell us what They’re going to do to us before They do it. So They seed clues into TV commercials, cartoons, magazine articles and even low-budget medical thrillers. Chemtrail researchers who look for predictive programming would probably point to the vaccine in Toxic Skies as just another ploy. First, the Illuminati poisons you with a chemtrail virus, then they dupe you into taking a vaccine that will also kill you. To my knowledge, no one has asked the director himself how he feels about chemtrails. Perhaps Mr. Erin just picked an interesting conspiracy theory to hang a thriller on, as so many screenwriters do. I challenge you to scan the list of conspiracy theories at Wikipedia and find a single one that hasn’t become fodder for entertainment. FEMA camps? X-files. Fluoride? Dr. Strangelove. Morgellons? Bugs. Local news station KSLA in Shreveport, Louisiana broadcasts a report on chemtrails. Producers sent water samples collected in August 2007, in Stamps, Arkansas to a lab. The man who collected the samples suspected that jets flying over his property were spewing chemicals or metals. The results showed the water to contain 68.8 parts per billion (68.8 µg/L) of barium. The EPA limit is 2 ppm (2000 µg/L), and the tests found 0.0688 ppm (68.8 µg/L), just 3.4% of the allowable limit. But the KSLA reporter misread 68.8 µg/L as 6.8 parts per million, over three times the EPA level. When the mistake was pointed out, KSLA issued a correction to its report. The first professionally produced, feature-length documentary about chemtrails is released. What in the World Are They Spraying?, directed by Michael J. Murphy, draws more attention to chemtrails than anything to date. The film centres on the geoengineering theory of chemtrails, though depopulation and a few other theories are mentioned. Once again, a racist connection to chemtrail theories rears its ugly head: The executive producer of WITWATS is G. Edward Griffin. A disciple of Hitler-adoring conspiranoid Eustace Mullins, Griffin was a speechwriter for George Wallace’s presidential campaign. Like Mullins, he has made a career out of promoting a broad array of conspiracy theories and quacky medical “cures” while warning about the Commie menace. 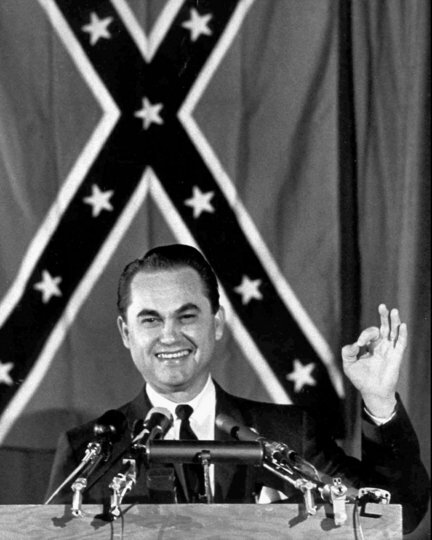 George Wallace wasn’t a racist. He just didn’t like black people, that’s all. Next to the work of Clifford Carnicom, the release and distribution of WITWATS is probably the single most important event in the history of the chemtrail phenomena. We’ll examine it in detail in a another post. Paul Wittenberger, co-director of What in the World Are They Spraying?, releases a documentary about depopulation, The Great Culling. It is promoted as a follow-up to WITWATS, but Michael J. Murphy and his Truth Media Productions distance themselves from it. Other chemtrail researchers, like Rosalind Peterson, ask not to be included in the film. Francis Mangels, a retiree who threatened to shoot down jets to preserve his veggie garden during a county meeting, also distances himself from the “culling” theory of chemtrails and the Wittenberger documentary. This entry was posted in Chemtrails, Conspiracy Theories, Controversies, Following the Chemtrails, Health, Hoaxes, Misinformation, Paranoia, Scams and tagged chemtrails, conspiracy theories, conspiracy theory, documentary, Following the Chemtrails, HAARP, health, hoax, Internet, New World Order, Patriot movement, predictive programming, science, weather modification. Bookmark the permalink. I know what I see with my own eyes and it matches up with patents for geoengineering.Try as you might, the straospheric aerosol program is in full bloom and full sight. I have captured hundreds of pictures in the little town I live in in Oregon.How much did they pay you to write your article to distract people from the truth? I regret to inform you that you have misinterpreted the message of this series. If you read the actual posts, rather than just the introduction, you will find that I am not in any way supporting the theory that contrails are being used to manipulate weather. There will be a post specifically on the issues of weather modification and geoengineering added to this series in the future. You will not like it. It would be a good idea for you to remove the links to this series from your blog – this is not the blog you seek to help validate your work. Sorry. The paper you cite on your blog seems to be a syllabus for a chemistry course with a clever title. It has nothing to do with jets, jet contrails, or weather modification. Wow, such an excellent post. I know you do a great deal of research for this blog but this was a particularly fantastic summary of the chemtrail nonsense. Thanks for writing it!